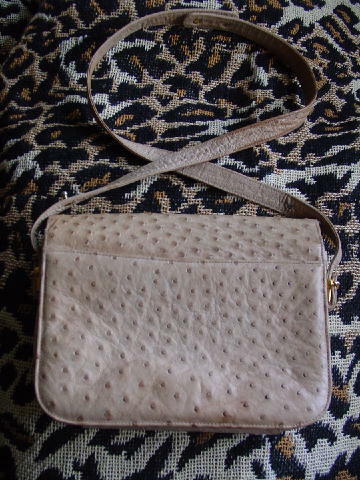 This vintage ostrich body skin purse is by Comtesse and was made in West Germany. It's in a light cocoa-bone with the quill marks (bumps) in a light brown. There are a few tiny worn spots on the bottom rims (they can be seen if you turn the purse upside down) and on the side rims. The unevenness of the skin color in certain areas is a part of its natural charm. There is a 39" long by 3/4" wide ostrich skin shoulder strap which can be made shorter (there are three gold-tone prongs) so you can carry it as a handbag. It has an envelope styling with a magnetic closure under the front flap. The straps are attached to the sides by gold-tone ridged ornaments and the front flap has a multiple bar and ridged decorative accent. The interior has two separate sections with a dark brown fabric-lined zipper compartment and a lower open compartment with a brown fabric front interior lining, and below that is a nameplate. 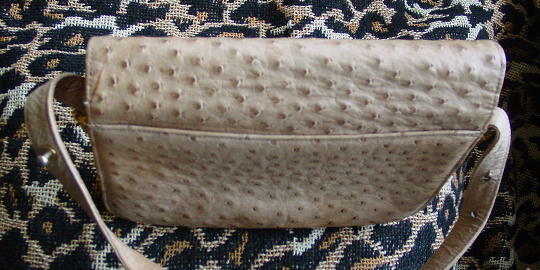 The rest of the interior of the purse is lined in a very soft dark brown leather which has a few makeup marks. 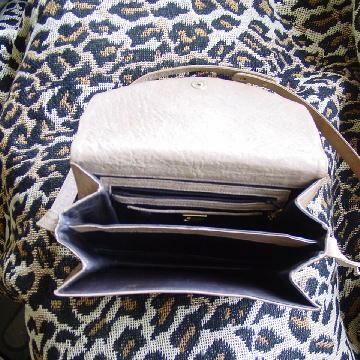 The front part of the interior divider and compartment edging are in ostrich skin. There is a back outer side to side compartment that has a light beige-bone fabric lining which has some age stains. 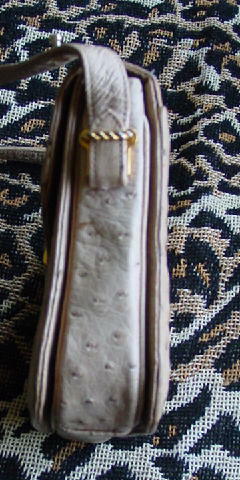 There is a tiny, very faint ink mark on the front of the purse 1 1/2" up from the bottom. 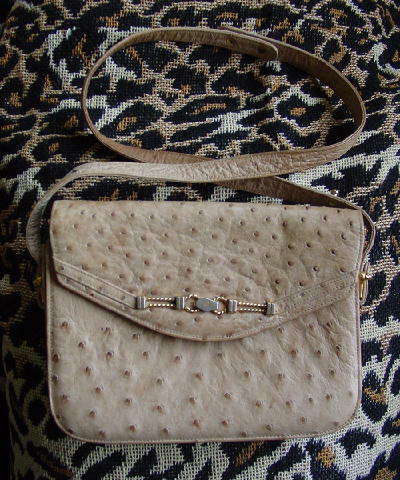 It's beautiful ostrich skin and has nice detailing. It can be worn from day to evening.